Ambridge Regional Distribution and Manufacturing Center is one of the longest-established industrial parks in the region. Our quality “Industrial Strength Space” has been carefully designed for optimum operating efficiency for all types of businesses. Spanning 85 acres, our complex contains 22 buildings, and over one million square feet of leasable space, which includes warehouse, office, wet lab, distribution, fabrication, manufacturing, light industrial and laydown space. Most of these areas have ceiling heights of more than 25 feet, and column widths that exceed the minimum standards for warehousing and distribution companies. Build-to-suit space is also available to tenant specifications. The Ambridge Regional Center is host to a vast spectrum of tenants that include international corporations and Fortune 500 companies. Entirely zoned for industry, we’re a designated Foreign Trade Zone (FTZ), and an Enterprise Zone. 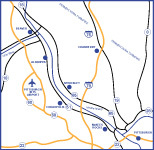 Ideally located, we’re convenient to Interstates 76, 79, and 376, Routes 60 & 65, the Greater Pittsburgh International Airport, Pittsburgh, and Cranberry Township. This makes us a nucleus for wide-ranging industrial and development endeavors, including the Marcellus and Utica shale projects, for which we are well-equipped. We’re also a mere eleven miles from the Royal Dutch Shell multi-billion-dollar ethane cracker plant. We offer ample utilities and a variety of other amenities and advantages. Our tenants enjoy direct access to service by the Norfolk Southern Rail Co., which connects with seven rail spurs, within the Ambridge Regional Center, that are adjacent to the Conway Rail Yard, and two nearby river terminals. We also provide on-site management and logistics services, through our Con-Am Warehouse, to help our tenants save on overhead costs and other expenses. We love working with real estate professionals.